Good Morning. 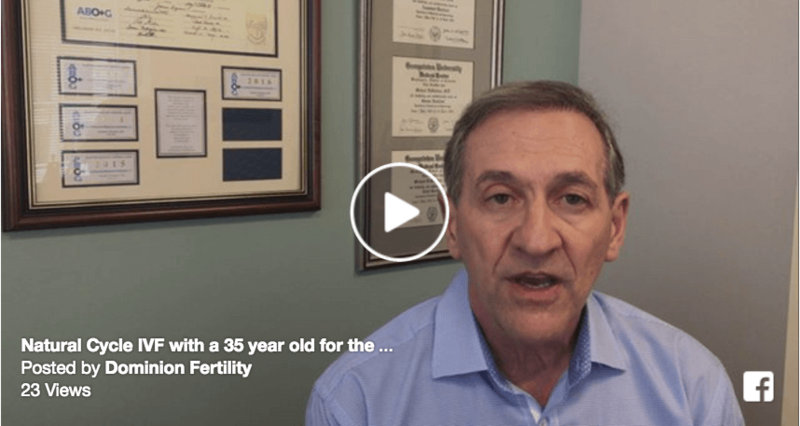 This is Dr. Michael DiMattina, Medical Director of Dominion Fertility in Arlington, Virginia. I want to talk to you about Natural Cycle IVF. I just did an egg collection on a patient who is about 35 years of age. Two years ago, she got pregnant using Natural Cycle IVF, where we took one egg, produced one embryo, and she got pregnant on her second embryo transfer. She is back today, ready for another pregnancy, and she underwent Natural Cycle IVF again. We easily collected the one egg. We plan to fertilize it this afternoon, transfer the embryo in few days, and hopefully she will have her second baby. Dominion Fertility offers many, many treatment options, more than many other fertility centers around the country. One of these treatments is Natural Cycle IVF. The world’s first IVF baby, produced in 1978, was from Natural Cycle IVF. Unfortunately, the pregnancy rates with IVF in those days were very low. Doctors began to use ovarian stimulation drugs and perform stimulated IVF in order to get more eggs and more embryos. Then they would transfer more embryos, in the hope that one of these embryos would implant. Well, that was then. Fast forward to today and we find our technology and our knowledge have improved tremendously, so we don’t need to do that, where we transfer many embryos. In fact, if we do that now, we end up with an “Octomom” situation, basically a disaster. We’re able to perform Natural Cycle IVF as long as a patient has regular menstrual cycles and a normal uterus. A patient who has regular menstrual cycles ovulates regularly, therefore we can collect the egg, fertilize it, and transfer it, and try to get her pregnant without using ovarian stimulation drugs. These drugs usually cost between $6,000 and $10,000 per treatment cycle. They are safe, but they are expensive, so a lot of patients use Natural Cycle IVF because they can’t afford to undergo stimulated IVF and use the ovarian stimulation drugs. Other patients, who have failed to get pregnant through traditional stimulated IVF, try Natural Cycle IVF, and often are pregnant and successful using that treatment. One of my patients, whom I helped using Natural Cycle IVF, tried stimulated IVF between the ages of 41 and 43, and she failed four treatments of stimulated IVF. This cost her about $150,000 at another fertility center. Indeed, one of my patients, whom I helped using Natural Cycle IVF, tried stimulated IVF between the ages of 41 and 43, and she failed four treatments of stimulated IVF. This cost her about $150,000 at another fertility center. She came to see me at age 47½, and I told her, really, she should use an egg donor at that age, but she still had regular menstrual cycles and she wanted to do Natural Cycle IVF. So, we did. We got the egg, fertilized it, and on her very first embryo transfer she got pregnant, and she had a normal, healthy baby. She was very lucky. In fact, I told her she hit the medical lottery. Natural Cycle IVF can be very useful for people who have failed stimulated IVF, patients who don’t want ovarian stimulation drugs, or who can’t afford ovarian stimulation drugs. Natural Cycle IVF can be very useful for people who have failed stimulated IVF, patients who don’t want ovarian stimulation drugs, or who can’t afford ovarian stimulation drugs. Many younger people don’t have the money to pay for the stimulated IVF. This is a great option, because Natural Cycle IVF costs significantly less than stimulated IVF. They are both good treatment options. It’s not that one is superior to the other, it just provides another option, another tool to get you a baby. That is our goal at Dominion Fertility, to get you a healthy baby, one baby at a time. That’s why we offer so many different options at Dominion Fertility. Our philosophy is to design a treatment option that works specifically for you. We do not use formulated cookie-cutter medicine, where everybody gets this treatment and if that doesn’t work, then you get the second treatment. Every couple is looked at individually and treatment programs are designed specifically for their needs. So, we are hoping today that this patient, who has already been successful with one IVF baby, using Natural Cycle IVF, is successful again using Natural Cycle IVF to have her second child. Learn more about Natural Cycle IVF.